Barbie of the late '60s and '70s. This huge and colorful set was designed to accomodate the popular sized 11 1/2 inch dolls. turkey on it. The refridgerator has swing-out shelves and two clear vegetable crisper bins. to hold the food, boxed items and accessories. brown cushioned chairs. Set came with red and white checkered placemats! As you can imagine, this is a very challenging set to complete. Not only do you have to find all of the little bitty accessories but there are frequently issues with the battery-operated appliances. Even if the battery connections are still good the stove light is quite often out and the hoses on the sink and dishwasher usually have deteriorated with time or are missing. Despite the age of this playset you can still find them boxed with 80% of the parts for $400-$600 or in lots containing just the appliances or tables and a smattering of food for $50-$75. Note: Amsco made a similar 7 piece kitchen set for 11-inch figures using see-through colored plastic. The beautiful set included a purple fridge, a green appliance cabinet with working blender, blue clothes-washer, yellow clothes-dryer, orange stove, pink dish-washer, and turquoise kitchen sink. 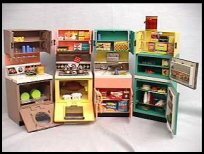 Also like the Dream Kitchen set, all of the appliances were battery-operated.